At Microsoft, we’re committed to helping users keep their data safe and secure. That’s why we support the industry’s move to use of TLS protocols as part of our effort to expand encryption across our networks and services. Bing has already been offering users the option to encrypt search traffic for about a year and a half now. Beginning this summer, we will begin the process of encrypting search traffic by default. This means that traffic originating from Bing will increasingly come from https://www.bing.com as opposed to http://www.bing.com. 1. Search Query Terms Report. 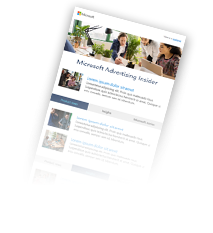 Available in the Bing Ads UI or through the API, the Search Query Terms Report lets you see what search queries triggered your ads and the associated performance metrics such as clicks, impressions and conversions. 2. Universal Event Tracking. Universal Event Tracking can provide enhanced performance metrics (e.g. bounce rates, duration per visit, pages per visit and total visits) associated to the query and keywords you bid on so you can better understand conversion performance. For advertisers, Universal Event Tracking is also the foundation to allow for Remarketing in Paid Search (currently in pilot). 3. Bing Webmaster Tools. Take advantage of Bing Webmaster tools as we will maintain keyword and ranking data inside the tools. With Bing Webmaster Tools you can be sure your site gets indexed in Bing, get access to research tools and reports that can help your search ranking and help you understand what led people to your website. Microsoft has a long-history and deep commitment to helping protect our customers’ data and the security of their systems. While this change may impact marketers and webmasters, we believe that providing a more secure search experience for our users is important. For our marketers and webmasters who utilize query data passed through the Bing referrer, be sure to explore the tools referenced above to help you optimize search traffic to your website.